This set of classic Rings and Coin trick comes with two REAL JADE BRACELETS that makes it a collector's item. From a small velvet bag you bring out two small jade rings, a red lucky envelope and carefully place them on top of the bag. You explain that the jade rings are traditional lucky charms for newborn babies in China, and newly wed couples give away "lucky money" on their wedding day with these lucky envelopes. From the red envelope you drop out a shiny gold Chinese coin that represents luck and prosperity. Tell your spectator you want to send her good luck and prosperity by performing a ritual using these lucky items. You place the rings over the coin with the red envelope in the middle, and then make a wish to send it your friend. You slowly remove the envelope and the coin is gone! You then repeat the actions and show that the coin has magically reappeared under the ring - "because the blessing will always come back to you one day." Each baby jade rings set comes with 10 golden brass Chinese coins (for give away), two red envelopes ( one more to spare) for the lucky money. The envelopes are embossed with the Chinese character "Double Happiness". The baby jade rings ( about 2" diameter) are authentic REAL JADE, and all the items are contained in a drawstring black velvet bag. The whole trick's effectiveness lies in this bag, which acts as a black-art mat and performing surface, giving it a good reason to be there. Many presentations themed around "Luck," "Prosperity," and "Blessings" can be created using these fine props. 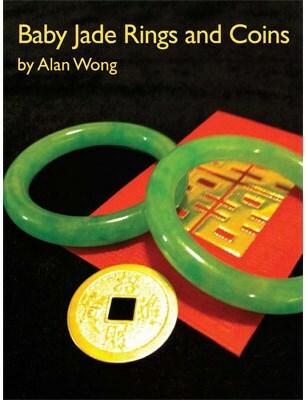 A separate smaller velvet bag is included to store and protect the jade rings when they are not in use. Instructional DVD included. Very easy to perform and great story telling piece. This elegant set of close-up magic can be carried in any close-up case or even in your pocket, always ready to perform.